Everything Eatherton: Brady: Name of the Game is "Sports"! Brady: Name of the Game is "Sports"! For the record: We live about 5 miles from Stanford, and Matt's parents, brother, sister-in-law, cousin, and cousin-in-law all went to Missouri. I have no idea where the Alabama thing came from. 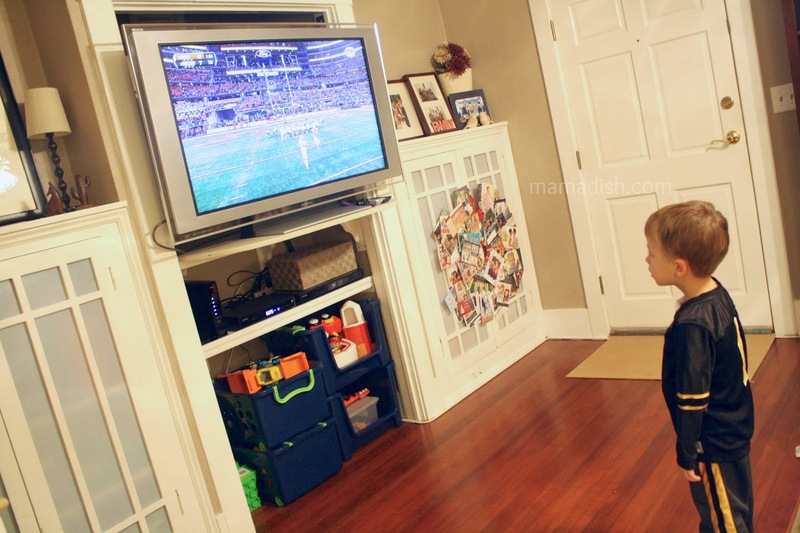 3/365: Waiting for the field goal. Brady eats, sleeps, and poops sports right now. Football. Basketball. Hockey. It's 24/7. If he's not watching a game, he's checking scores on his "sports apps" or talking about yesterday's games. Or last week's games. Whatever he still has on his mind. Or watching Sports Center, for the love of Pete. Currently his favorite teams include... Denver Broncos, Miami Heat, Chicago Blackhawks, Alabama Crimson Tide, San Francisco 49ers, Chicago Bears, Chicago Bulls, Stanford Cardinal, Missouri Tigers, and Michigan State Spartans. I've tried talking to him about loyalty a thousand times, but he just cannot put all his eggs in one basket. He's a bandwagon fan, at it's finest. And it's just fine by him. In one breath he can go from talking hockey highlights, to BCS standings, to a bad call on on the Chargers on 3rd and 8. I'm a sport-loving kind of girl, but I have sports whiplash most days with this one. Is this a normal thing with boys?! But he's passionate about it and it makes him happy (well, mostly happy. Boy had a MAJOR BREAKDOWN when Alabama lost to Auburn a few ago. Oh maaaan....) I have to say, what I love most about his sports addiction is how educational it has been for him. When he talks scores, he always includes, "they're winning by 7! ", or "they lost by 22", or "they're ranked higher because they have 2 more wins". I am really amazed at how his math skills have soared in the last 6 months. Two years ago he was so into guitars and Joe Bonamassa that I thought for sure he had found his true calling, but now... he can barely recall the words to his old favorite song, "John Henry". So, who knows what the future will hold for this one, but right now, sports is the name of his game! Weekend Recap: Aunt Amanda Was Here! Back From A Break. Welcome 2014!